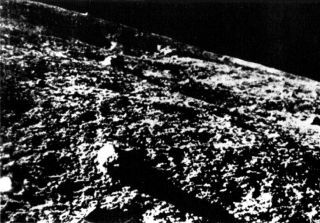 The first image from the surface of the moon, taken by the Luna 9 spacecraft. Luna 9 was the first soft landing mission on the moon. The Soviet spacecraft arrived three years before the first humans stepped out on the surface. It was part of a long-range Soviet Union program to photograph and learn more about the moon. In the 1960s, the United States and the Soviet Union were engaged in a "space race" that ultimately saw the Americans land the first humans on the moon in 1969. The Soviets were unable to get their Zond rocket program going, even after a series of test flights. One blew up on the launch pad in 1968 and killed several people. When the Soviets were unable to reach the hurdle of bringing humans to the moon, they instead focused on a series of successful robotic missions, culminating with two rover missions in the 1970s that collectively travelled dozens of miles. Their earlier robotic missions had already attracted a lot of international attention. Luna 3 flew past the moon in 1959, just two years after the first satellite was sent into space (also by the Soviet Union). What's more, Luna 3 even took pictures of the moon's far side, which had never been glimpsed by humans before. Flying by was difficult enough, but landing was another thing entirely. The Soviets (and the Americans) had certainly crash-landed probes on to the surface before, in some cases deliberately. Landing successfully, however, requires precision, something to cushion the spacecraft from a hard fall (such as rockets) and a way of transmitting the information reliably back to Earth. There were also a small number of experts who wondered if the lunar surface could even support a landing. Some thought that any spacecraft that landed on the moon would sink down into a pile of dust, and have difficulty emerging again. Airbags mounted on the Luna 9 landing capsule helped cushion the impact. The spacecraft launched successfully on Jan. 31, 1966, and got to the moon on Feb. 3. While the entire spacecraft descended to the surface, a landing capsule was ejected just before impact (16 feet, or 5 meters, above) for the soft landing. This "automatic lunar station" that landed on the surface was spherical, about 5 feet (58 centimeters) across and weighed about 218 lbs. (99 kilograms), according to NASA. "The station consisted of a hermetically sealed container, pressurized to 1.2 atmospheres, which held the radio system, programming device, batteries, thermal control system and scientific apparatus. Four antennas that automatically opened after landing were mounted on the outside of the compartment," NASA wrote, adding that there also were airbags mounted to the lander to cushion the impact. In addition to the equipment needed to keep the spacecraft healthy, as well as fuel, it carried some scientific equipment. This included a television camera and a radiation detector. The spacecraft bounced on the lunar surface several times before stopping in the Ocean of Storms, according to NASA. About 250 seconds after landing, four petals stabilized the spacecraft and the television system began sending pictures back to Earth. The early days of space photography were difficult, but over time controllers could get a sense of what the surface looked like. The first test image, which showed very poor contrast because the Sun was only about 3 degrees above the horizon, was completed 15 minutes [after landing]," NASA stated. "Seven radio sessions, totaling 8 hours and 5 minutes, were transmitted as were three series of TV pictures. When assembled, the photographs provided four panoramic views of the nearby lunar surface." Luna 9 survived three Earth-days on the surface until its batteries ran down. From the pictures, scientists could tell that the spacecraft had landed near an 82-foot (25-meter) crater. The lander was initially at a 15-degree tilt, but the regolith (soil) on the moon shifted underneath it and placed the lander at a 22.5 degree tilt, according to the pictures. After landing, four petals stabilized the spacecraft, and four antennas extended to transmit pictures. Several soft landings after Luna 9 happened in quick succession, both by the United States and the Soviet Union. The United States' Surveyor 1 made that country's first landing in May 1966. Both the Soviet Union and the United States sent several robotic probes to the moon afterward, with the Soviet Union also focusing on aspects such as sample return (Luna 16) and deploying rovers (Lunokhods 1 and 2 on Lunas 17 and 21, respectively). The United States also sent six human missions to the lunar surface between 1969 and 1972. Soft landings on the moon wouldn't happen again until 2013, when China sent the Chang'e-3 lander and Yutu rover to the surface that December. Yutu survived more than 31 months on the surface, although it stopped being able to move after only a few weeks. As of September 2015, scientists have searched in vain to find Luna 9 on the surface of the moon. This is after NASA's Lunar Reconnaissance Orbiter successfully imaged numerous spacecraft on the surface, including the Soviet Lunokhods 1 and 2.